Trivikram Srinivas’ wife Sowjanya Srinivas is not seen often in social circles. Not many know that she is a great cultural dancer and dance exponent. Her classical dance talent was witnessed during her latest stint at Kala Bharathi in Visakhapatnam. Taking many by surprise, Sowjanya Srinivas has stunned everyone with her cultural dance show at Visakhapatnam. Gajanananeeyam, Srirama Kathasaram, Sasirekha Parinayam, Narakasura Samharam, Krishna Tatvam, Tillana have been performed by Sowjanya at the concert. Sangamam Foundation and Kala Vedika Cultural Charitable Trust have jointly organized the concert in Kala Bharathi of Visakhapatnam. Popular lyric writer and her uncle Padma Shri Sirivennela Seetharama Sastry, husband- star director Trivikram Srinivas, Comedian Jayaprakash Reddy and others have attended the concert. 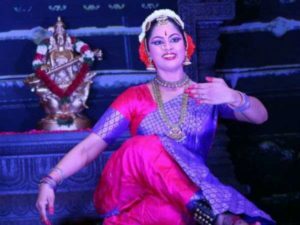 Sowjanya Srinivas’ cultural dance performance have received wide appreciation and have got thumbs up from the audiences. By encouraging her talent and supporting her to do the concert, appreciations galore for husband Trivikram Srinivas. Previous articleMega Hero With Foreign Girl In Mumbai!